Description of soil is a statement describing the physical nature and state of the soil. It can be a description of a sample, or a soil in situ. It is arrived at using visual examination, simple tests, observation of site conditions, geological history, etc. Soil classification is the separation of soil into classes or groups each having similar characteristics and potentially similar behaviour. A classification for engineering purposes should be based mainly on mechanical properties, e.g. permeability, stiffness, strength. The class to which a soil belongs can be used in its description. Soils consist of grains (mineral grains, rock fragments, etc.) with water and air in the voids between grains. The water and air contents are readily changed by changes in conditions and location: soils can be perfectly dry (have no water content) or be fully saturated (have no air content) or be partly saturated (with both air and water present). Although the size and shape of the solid (granular) content rarely changes at a given point, they can vary considerably from point to point. First of all, consider soil as a engineering material - it is not a coherent solid material like steel and concrete, but is a particulate material. It is important to understand the significance of particle size, shape and composition, and of a soil's internal structure or fabric. built on: foundations to buildings, bridges. built in: tunnels, culverts, basements. built with: roads, runways, embankments, dams. Soils may be described in different ways by different people for their different purposes. Engineers' descriptions give engineering terms that will convey some sense of a soil's current state and probable susceptibility to future changes (e.g. in loading, drainage, structure, surface level). Engineers are primarily interested in a soil's mechanical properties: strength, stiffness, permeability. These depend primarily on the nature of the soil grains, the current stress, the water content and unit weight. The range of particle sizes encountered in soil is very large: from boulders with a controlling dimension of over 200mm down to clay particles less than 0.002mm (2mm). Some clays contain particles less than 1 mm in size which behave as colloids, i.e. do not settle in water due solely to gravity. SAND (and coarser) particles are visible to the naked eye. SILT particles become dusty when dry and are easily brushed off hands and boots. CLAY particles are greasy and sticky when wet and hard when dry, and have to be scraped or washed off hands and boots. SANDS include gravelly sands and gravel-sands. Sand grains are generally broken rock particles that have been formed by physical weathering, or they are the resistant components of rocks broken down by chemical weathering. Sand grains generally have a rotund shape. CLAYS include silty clays and clay-silts; there are few pure silts (e.g. areas formed by windblown L�ess). Clay grains are usually the product of chemical weathering or rocks and soils. Clay particles have a flaky shape. There are major differences in engineering behaviour between SANDS and CLAYS (e.g. in permeability, compressibility, shrinking/swelling potential). The shape and size of the soil grains has an important bearing on these differences. SAND and larger-sized grains are rotund. Coarse soil grains (silt-sized, sand-sized and larger) have different shape characteristics and surface roughness depending on the amount of wear during transportation (by water, wind or ice), or after crushing in manufactured aggregates. They have a relatively low specific surface (surface area). CLAY particles are flaky. Their thickness is very small relative to their length & breadth, in some cases as thin as 1/100th of the length. They therefore have high to very high specific surface values. 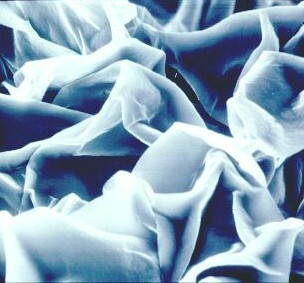 These surfaces carry a small negative electrical charge, that will attract the positive end of water molecules. This charge depends on the soil mineral and may be affected by an electrolite in the pore water. This causes some additional forces between the soil grains which are proportional to the specific surface. 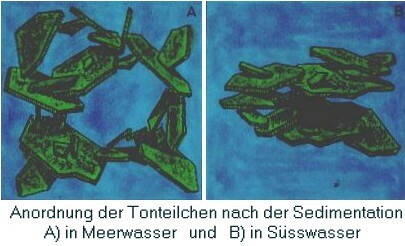 Thus a lot of water may be held asadsorbed water within a clay mass. Specific surface is the ratio of surface area per unit wight. Surface forces are proportional to surface area (i.e. to d�). Self-weight forces are proportional to volume (i.e. to d�). Hence, specific surface is a measure of the relative contributions of surface forces and self-weight forces. SAND grains (size 2.0 - 0.06mm) are close to cubes or spheres in shape, and have specific surfaces near the minimum value. CLAY particles are flaky and have much greater specific surface values. The more elongated or flaky a particle is the greater will be its specific surface. Natural soils are rarely the same from one point in the ground to another. The content and nature of grains varies, but more importantly, so does the arrangement of these. The arrangement and organisation of particles and other features within a soil mass is termed its structure or fabric. This includes bedding orientation, stratification, layer thickness, the occurrence of joints and fissures, the occurrence of voids, artefacts, tree roots and nodules, the presence of cementing or bonding agents between grains. Structural features can have a major influence on in situ properties. Vertical and horizontal permeabilities will be different in alternating layers of fine and coarse soils. The presence of fissures affects some aspects of strength. The presence of layers or lenses of different stiffness can affect stability. The presence of cementing or bonding influences strength and stiffness. subsequent conditions of loading and drainage - little or no surcharge, heavy surcharge due to ice or overlying deposits, change from saline to freshwater, leaching, contamination. formed by the alteration of existing rocks due to heat from igneous intrusions (e.g. marble, quartzite, hornfels) or pressure due to crustal movement (e.g. slate, schist, gneiss). Physical or mechanical processes taking place on the Earth's surface, including the actions of water, frost, temperature changes, wind and ice; cause disintegration and wearing. The products are mainly coarse soils (silts, sands and gravels). Physical weathering produces Very Coarse soils and Gravels consisting of broken rock particles, but Sands and Silts will be mainly consists of mineral grains. Chemical weathering occurs in wet and warm conditions and consists of degradation by decomposition and/or alteration. The results of chemical weathering are generally fine soils with separate mineral grains, such as Clays and Clay-Silts. The type of clay mineral depends on the parent rock and on local drainage. Some minerals, such as quartz, are resistant to the chemical weathering and remain unchanged. A resistant and enduring mineral found in many rocks (e.g. granite, sandstone). It is the principal constituent of sands and silts, and the most abundant soil mineral. It occurs as equidimensional hard grains. A red iron (ferric) oxide: resistant to change, results from extreme weathering. It is responsible for the widespread red or pink colouration in rocks and soils. It can form a cement in rocks, or a duricrust in soils in arid climates. Flaky minerals present in many igneous rocks. Some are resistant, e.g. muscovite; some are broken down, e.g. biotite. These result mainly from the breakdown of feldspar minerals. They are very flaky and therefore have very large surface areas. They are major constituents of clay soils, although clay soil also contains silt sized particles. Clay minerals are produced mainly from the chemical weathering and decomposition of feldspars, such as orthoclase and plagioclase, and some micas. They are small in size and very flaky in shape. The key to some of the properties of clay soils, e.g. plasticity, compressibility, swelling/shrinkage potential, lies in the structure of clay minerals. (include kaolinite, dickite and nacrite) formed by the decomposition of orthoclase feldspar (e.g. in granite); kaolin is the principal constituent in china clay and ball clay. (include illite and glauconite) are the commonest clay minerals; formed by the decomposition of some micas and feldspars; predominant in marine clays and shales (e.g. London clay, Oxford clay). Due to combinations of gravity, flowing water or air, and moving ice. In water or air: grains become sub-rounded or rounded, grain sizes are sorted, producing poorly-graded deposits. In moving ice: grinding and crushing occur, size distribution becomes wider, deposits are well-graded, ranging from rock flour to boulders. In flowing water, larger particles are deposited as velocity drops, e.g. gravels in river terraces, sands in floodplains and estuaries, silts and clays in lakes and seas. In still water: horizontal layers of successive sediments are formed, which may change with time, even seasonally or daily. Deltaic & shelf deposits: often vary both horizontally and vertically. From glaciers, deposition varies from well-graded basal tills and boulder clays to poorly-graded deposits in moraines and outwash fans. In arid conditions: scree material is usually poorly-graded and lies on slopes. Wind-blown L�ess is generally uniformly-graded and false-bedded. The current state (i.e. density and consistency) of a soil will have been profoundly influenced by the history of loading and unloading since it was deposited. Changes in drainage conditions may also have occurred which may have brought about changes in water content. During deposition the load applied to a layer of soil increases as more layers are deposited over it; thus, it is compressed and water is squeezed out; as deposition continues, the soil becomes stiffer and stronger. The principal natural mechanism of unloading is erosion of overlying layers. Unloading can also occur as overlying ice-sheets and glaciers retreat, or due to large excavations made by man. Soil expands when it is unloaded, but not as much as it was initially compressed; thus it stays compressed - and is said to be overconsolidated. The degree of overconsolidation depends on the history of loading and unloading. Some soils initially deposited loosely in saline water and then inundated with fresh water develop weak collapsing structure. In arid climates with intermittent rainy periods, cycles of wetting and drying can bring minerals to the surface to form a cemented soil. Some clays (e.g. montmorillonite clays) are prone to large volume changes due to wetting and drying; thus, seasonal changes in surface level occur, often causing foundation damage, especially after exceptionally dry summers. Trees extract water from soil in the process of evapotranspiration; The soil near to trees can therefore either shrink as trees grow larger, or expand following the removal of large trees. The recommended standard for soil classification is the British Soil Classification System, and this is detailed in BS 5930 Site Investigation. Coarse soils are classified principally on the basis of particle size and grading. The aim is to measure the distribution of particle sizes in the sample. When a wide range of sizes is present, the sample will be sub-divided, and separate tests carried out on each sub-sample. Full details of tests are given in BS 1377: "Methods of test for soil for civil engineering purposes". Wet sieving to separate fine grains from coarse grains is carried out by washing the soil specimen on a 60mm sieve mesh. Dry sieving analyses can only be carried out on particles > 60 mm. Samples (with fines removed) are dried and shaken through a nest of sieves of descending size. Sedimentation is used only for fine soils. Soil particles are allowed to settle from a suspension. The decreasing density of the suspension is measured at time intervals. Sizes are determined from the settling velocity and times recorded. Percentages between sizes are determined from density differences. The cumulative percentage quantities finer than certain sizes (e.g. passing a given size sieve mesh) are determined by weighing. Points are then plotted of % finer (passing) against log size. A smooth S-shaped curve drawn through these points is called a grading curve. The position and shape of the grading curve determines the soil class. Geometrical grading characteristics can be determined also from the grading curve. Both the position and the shape of the grading curve for a soil can aid its identity and description. The results of a dry-sieving test are given below, together with the grading analysis and grading curve. Note carefully how the tabulated results are set out and calculated. The grading curve has been plotted on special semi-logarithmic paper; you can also do this analysis using a spreadsheet. In the case of fine soils (e.g. CLAYS and SILTS), it is the shape of the particles rather than their size that has the greater influence on engineering properties. Clay soils have flaky particles to which water adheres, thus imparting the property of plasticity. Consistency varies with the water content of the soil. The consistency of a soil can range from (dry) solid to semi-solid to plastic to liquid (wet). The water contents at which the consistency changes from one state to the next are called consistency limits (or Atterberg limits). Measures of liquid and plastic limit values can be obtained from laboratory tests. The consistency of most soils in the ground will be plastic or semi-solid. Soil strength and stiffness behaviour are related to the range of plastic consistency. The range of water content over which a soil has a plastic consistency is termed the Plasticity Index (IP or PI). A plasticity chart is provided to aid classification. So-called 'clay' soils are not 100% clay. The proportion of clay mineral flakes (< 2 mm size) in a fine soil affects its current state, particularly its tendency to swell and shrink with changes in water content. The degree of plasticity related to the clay content is called the activity of the soil. Specific gravity (Gs) is a property of the mineral or rock material forming soil grains. For fine soils a 50 ml density bottle may be used; for coarse soils a 500 ml or 1000 ml jar. The jar is weighed empty (M1). A quantity of dry soil is placed in the jar and the jar weighed (M2). The jar is filled with water, air removed by stirring, and weighed again (M3). The jar is emptied, cleaned and refilled with water - and weighed again (M4). The volume-weight properties of a soil define its state. Measures of the amount of void space, amount of water and the weight of a unit volume of soil are required in engineering analysis and design. Solid: rock fragments, mineral grains or flakes, organic matter. Liquid: water, with some dissolved compounds (e.g. salts). Gas: air or water vapour. In natural soils the three phases are intermixed. To aid analysis it is convenient to consider a soil model in which the three phases are seen as separate, but still in their correct proportions. Typical void ratios might be 0.3 (e.g. for a dense, well graded granular soil) or 1.5 (e.g. for a soft clay). Note: In clay soils as the amount water increases the volume and therefore the volume of voids will also increase, and so the degree of saturation may remain at Sr = 1 while the actual volume of water is increasing. The air-voids volume, Va , is that part of the void space not occupied by water. The mass of air may be ignored. The mass of solid particles is usually expressed in terms of their particle density or grain specific gravity. The ratio of the mass of water present to the mass of solid particles is called the water content, or sometimes the moisture content. Density is a measure of the quantity of mass in a unit volume of material. Unit weight is a measure of the weight of a unit volume of material. There are two basic measures of density or unit weight applied to soils: Dry density is a measure of the amount of solid particles per unit volume. Bulk density is a measure of the amount of solid + water per unit volume. It is important to quantify the state of a soil immediately it is received in the testing laboratory and just prior to commencing other tests (e.g. shear tests, compression tests, etc.). The water content and unit weight are particularly important, since these could change during transportation and storage. Some physical state properties are calculated following the practical measurement of others; e.g. void ratio from porosity, dry unit weight from unit weight & water content. The most usual method of determining the water content of soil is to weigh a small representative specimen, drying it to constant weight and then weighing it again. Drying can be carried out using an electric oven set at 104-105� Celsius or using a microwave oven. Example: A sample of soil was placed in a tin container and weighed, after which it was dried in an oven and then weighed again. Calculate the water content of the soil. Clay soils: Specimens are usually prepared in the form of regular geometric shapes, (e.g. prisms, cylinders) of which the volume is easily computed. Sands and gravels: Specimens have to be placed in a container to determine volume (e.g. a cylindrical can). A soil specimen had a volume of 89.13 ml, a mass before drying of 174.45 g and after drying of 158.73 g; the water content was 9.9 %. Determine the bulk and dry densities and unit weights. Measurements taken in the field are mostly to determine density/unit weight. The most common application is the determination of the density of rolled and compacted fill, e.g. in road bases, embankments, etc. Note: These methods are covered in detail by BS1377. You should understand the general principle that density is calculated from the mass and volume of a sample. How a sample of known volume is obtained depends on the nature of the soil. You are not expected to remember the details of each method. This method is suitable for soft fine grained soils. A steel cylinder is driven into the ground, dug out and the soil shaved off level. The mass of soil is found by weighing and deducting the mass of the cylinder. Small samples are taken from both ends and the water content determined. Using a special tray with a hole in the centre, a hole is formed in the soil and the mass of soil removed is weighed. The volume of the hole is calculated from the mass of clean dry running sand required to fill the hole. The sand-pouring cylinder is used to fill the hole in a controlled manner. The mass of sand required to fill the hole is equal to the difference in the weight of the cylinder before and after filling the hole, less an allowance for the sand left in the cone above the hole. Engineering operations (e.g. excavation, loading, unloading, compaction, etc.) on soil bring about changes in its state. Its initial state is the result of processes of erosion and deposition. It is possible for the engineer to predict changes that could result from a proposed engineering operation: changes from the soil's current state to a new future state. Most soils are formed in layers or lenses by deposition from moving water, ice or wind. One-dimensional compression occurs as overlying layers are added. Vertical and horizontal stresses increase with deposition. Erosion causes unloading; stresses decrease; some vertical expansion occurs. Plastic strain has occurred; the soil remains compressed, i.e. overconsolidated. Subsequent changes may occur in the depositional environment: further loading/unloading due to glaciation, land movement, engineering; and ageing processes. The term ageing includes processes that occur with time, except loading and unloading. Ageing processes are independent of changes in loading. Fine soils creep and continue to compress and distort at constant effective stress after primary consolidation is complete. Intergranular cementing and bonding occurs due to deposition of minerals from groundwater, e.g. calcium carbonate; disturbance due to excavation fractures the bonding and reduces strength. Physical and chemical changes take place in soils near the ground surface due to the influence of changes in rainfall and temperature. Changes in the salinity of groundwater are due to changes in relative sea and land levels, thus soil originally deposited in sea water may later have fresh water in its pores, such soils may be prone to sudden collapse. The void ratio of coarse soils (sands and gravels) varies with the state of packing between the loosest practical state in which it can exist and the densest. Some engineering properties are affected by this, e.g.shear strength, compressibility, permeability. Preliminary estimates of strength and stiffness can provide a useful basis for early design and feasibility studies, and also the planning of more detailed testing programmes. The following suggestions have been made; they are simple, but not necessarily reliable, and should be not be used in final design calculations. BS 5930 Site Investigation recommends the terminology and a system for describing and classifying soils for engineering purposes. Without the use of a satisfactory system of description and classification, the description of materials found on a site would be meaningless or even misleading, and it would be difficult to apply experience to future projects. Not all characteristics are necessarily applicable in every case. (ii) Dense fissured unweathered greyish-blue firm CLAY. Oxford clay. massive(>2m), thickly bedded (2000-600 mm), medium bedded (600-200 mm), thinly bedded (200-60 mm), very thinly bedded (60-20 mm), laminated (20-6 mm), thinly laminated (<6 mm). i.e. spacing of joints and fissure: very widely spaced(>2m), widely spaced (2000-600 mm), medium spaced (600-200 mm), closely spaced (200-60 mm), very closely spaced (60-20 mm), extremely closely spaced (<20 mm). very soft (exudes between fingers), soft (easily mouldable), firm (strong finger pressure required), stiff (can be indented with fingers, but not moulded) very stiff (indented by sharp object), hard (difficult to indent). well graded (wide size range), uniform (very narrow size range), poorly graded (narrow or uneven size range).